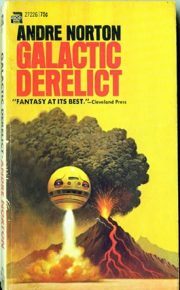 The 1982 Ace edition of 1959’s Galactic Derelict is billed as “Book #2 in the Ross Murdoch series.” That bit is misleading. While Ross does appear in the book, he’s only a supporting character; its true protagonist is Travis Fox. If Ace had billed this as Time Traders #2, that would have dodged the whole ‘who is the protagonist?’ issue. I could give this book another blurb: “first Andre Norton SF reviewer James Nicoll ever read.” That was way back in 1972, an earlier edition of the book, another time. It was the best of times, it was the worst of times … sorry, I get flashbacks. When we first meet him, Travis Fox is out in the wilderness near his brother’s ranch, trying to work out where best to water his brother’s cattle. He has to decide whether to rely on traditional Apache wisdom, which is the direction Travis is leaning and which will probably work, or to stick strictly to the White Man’s Way, which is the direction his brother leans. Because the white settlers don’t have the depth of knowledge about the region’s climate and weather that the Apache do, the White Man’s Way is likely to fail. But if Travis relies on traditional wisdom, his brother will be offended. It’s a nice illustration of the trap in which Travis finds himself. He is torn between his people’s traditions and the relentless pressure to conform to the ways of the white invaders. Of course, while conformity is demanded, it is not always rewarded: college-educated Travis was fired from an archaeological expedition because the man funding it objected to his race. Travis’s search for water lands him in the midst of a top-secret excavation. Operation Retrograde, the US government time-travel agency, is digging in Travis’s backyard. He is promptly detained in the name of national security, the crisis between East and West having escalated (thanks to events at the end of the first book in the series, The Time Traders). Unlike the bigots and enablers at college, Dr. Gordon Ashe and the rest of the Operation Retrograde team don’t care about a man’s race as long as he knows his stuff; Travis’s particular skill set makes him a valuable addition to the team. Armed with a list of alien spaceship crash sites retrieved by Ross in the previous book, the team is scanning the past for wrecks that might have sustained less-than-major damage in landing. If they are lucky, they might find spacecraft that are still operational, or operational enough that the Americans can reverse engineer the secret of star flight. Sure enough, while most of the ships were destroyed on impact, at least one managed to land safely before its crew expired (for unknown but plot-friendly reasons). Transporting the ship to the future isn’t exactly easy but it can be done. Now the thing about alien technology is … you can never be sure that what seems to you like a perfectly harmless act—dragging a spacecraft fifteen thousand years through time, say—won’t turn out to trigger the ship’s automated launch and navigational systems. No sooner does the ship arrive in 1985 than it takes off for the stars, carrying four Americans—Travis, Ross, Ashe, and Renfry—into the deeps of space. Fifteen thousand years is a very long time as humans measure it. No human civilization, not even China, has ever survived across a comparable expanse of time. The beings who built the ship weren’t human, however, and so it is with considerable trepidation that the four humans wait to see whether their automated ship drops them into the middle of ancient ruins or into the even more highly advanced descendents of the Baldies (the previous owners of the starship) and their fellow starfarers . Neither option is necessarily inviting. Even if they are not dragged from the ship by hyper-advanced aliens eager to obtain new and exotic lab animals, the four humans have absolutely no idea how to make the ship reverse its course to take them home to Earth. They may be spending the rest of their lives marooned out among the stars. The particular printing I read in the 1970s (long lost, sadly) had a feature that managed to make the ending more of a surprise than it might otherwise have been: the final signature of the book was included twice. The plot was resolved well before the number of pages remaining suggested that the book would end. I can’t actually recommend that publishers add superfluous pages to generate suspense, but the tactic was quite effective that one time. Rereading the book after a lapse of two generations, I can see that I completely missed the significance of the subplot about Travis being caught between Apache and white ways of living. There’s a parallel between what was done to Travis’s people and what may happen to the beings living in the ruins of an ancient and fallen galactic empire. Ross, Ash, and Renfry may miss it but Travis won’t. Another detail jumped out at me on this reread. I don’t know if it is significant or just apophenia. Is it mere chance that H. Beam Piper’s 1963 novel Cosmic Computer, which also about poring over the relics of a once-great culture and the inevitability of its eventual collapse, features a supporting character named Foxx Travis? Norton’s tour of an interstellar empire that is well past its sell-by date, an empire maintained by ancient, mindless machines and populated by what seem to be the evolved pets of the vanished starfarers, was pretty heady stuff for an eleven-year-old me. Thanks to this book, there’s a “Galactic Derelict plot” set of receptors in my brain from which later novels by other, lesser authors have benefited. 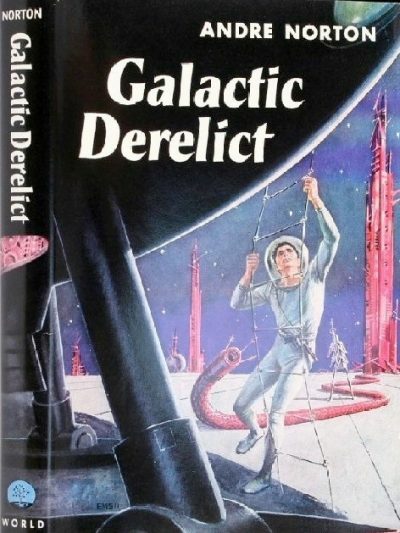 Galactic Derelict stands up pretty well for a fifty-six-year-old SF novel and I would recommend it to your attention. I know it is available for free in omnibus form, although—as previously mentioned— the Baen edition has been edited to spare delicate modern sensibilities. I don’t offhand know of other recent editions. 1: Stars move, so there’s a third alternative, in which the ship shows up where the target systems would have been fifteen thousand years ago to find deep space. All die, O the embarrassment. Norton does not do that sort of downer, so that’s not what happens.